We take countless drinks of water daily without thinking about. We turn on the faucet and we’re surprised when water doesn’t flow. We have bottles, fountains, and reservoirs for water. Water is common in our daily life, and yet it’s anything but ordinary. Water is life. The world’s surface is 71% water, our bodies are almost 60% water, and we’re hard-pressed to find something we do in our daily life that doesn’t involve water. That’s where we find Jesus as he speaks this fifth word on the cross. In Jesus’ seemingly ordinary request for a drink, he reveals the extraordinary work he is doing for us on the cross. It is simultaneously a cry of physical and spiritual suffering. In his humanity, Jesus suffered physically for us, as one of us. Jesus is our second Adam, bone of our bone and flesh of our flesh. He ate supper with his disciples. He wept at Lazarus’ tomb. He thirsted on the cross. From his birth in Bethlehem to his death in Jerusalem, from his resurrection to his ascension, Jesus bears our humanity with us, for us, as one of us. As the church father Gregory of Nazianzus said, “what Jesus did not assume, he did not redeem.” To satisfy our greatest need, to be our perfect substitute, Jesus became man. Jesus thirsted for you. Jesus suffered the physical punishment of our sin. And in doing so, he fulfilled the Scripture. Ordinary though Jesus’ words may seem, they reveal something truly extraordinary about his death on the cross for us. As Jesus cries out, “I thirst” he is also suffering our greatest need, our spiritual thirst, our lack and absence from our Heavenly Father. Jesus’ physical thirst on the cross also reveals our thirst and need for God himself. Jesus’ thirst reveals the depth of our sinful condition, that in our sin we are absent from God. God made us to be in communion with him, calls us his people, and declares us his children. And yet, our desire for God has been so warped and turned inward, that we turn his gifts into idols. We look at our own hands, minds, and labor in appreciation for our daily bread. We look to our intelligence, creativity, or success to satisfy our desires and needs. We look to our own works, ways of life, and will to satisfy our spiritual thirst, only to find that we are parched and dehydrated before our Lord. We search in vain for living waters in the fetid swamp of our sinful hearts. Our sinful quest for spiritual satisfaction is like trying to guzzle saltwater to quench our thirst; we end up finding ourselves thirstier than before. We are empty. Jesus must fill us with his love. We are absent from God. Jesus must draw us near, by drawing near to us. Now on the cross, he brings you living water by his thirst and death for you. Jesus is deprived of life to save our life. Jesus suffers one of humanity’s most basic needs to satisfy our greatest need before God. Jesus fulfills the scripture to accomplish our rescue from every thought, word, and deed we’ve done in hopes of satisfying our own thirst. Jesus thirsted on the cross so that you and I need never thirst for God. Jesus sacrifices himself, his thirst, his body, his blood all for you. In the Old Testament sacrifices, the Lord instructed the priests to dip a hyssop branch in the blood as a sign of God’s atonement for sin. Now on the cross, Jesus our great high priest receives a hyssop branch with sour wine as he atones for our sin. In the Passover, the people of Israel of Israel painted their doorposts with a hyssop branch dipped in the blood of the sacrificial lamb. 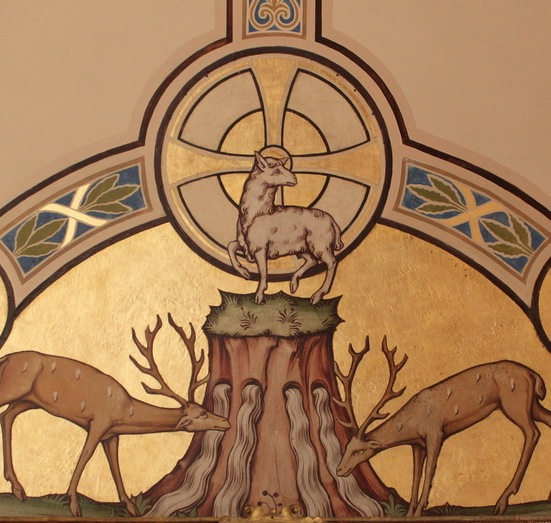 Now on the cross, Jesus accomplishes a greater Passover for all people as the hyssop branch marks him as the Lamb of God who takes away the sin of the world. In the Psalms, David prayed that the Lord would purge his sin with hyssop that he would be cleansed of sin. Now, in Jesus, David’s son and David’s Lord, our sin is cleansed as the hyssop branch approaches the mouth of him who thirsts for us. And the blood of Jesus cleanses us from all sin. As water is vital to our earthly life, so it is for our spiritual life. 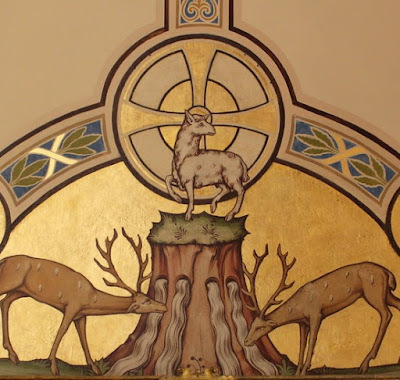 Once again, through ordinary means – water, words, bread and wine - Jesus pours out, fills, and satisfies us with his extraordinary, abundant grace, a wellspring of eternal life. In Holy Baptism, Jesus pours out living water from his pierced side and washes away your sins. Jesus bathes you in his death and resurrection in the living waters of the font, a true fountain of life. In his Holy Word, Jesus sends forth a river of life, teeming with his promises that declares us his new creation. Jesus’ forgiveness floods the wasteland of our sinful hearts into a reservoir of his mercy. In the Holy Supper, Jesus gives us the same body that thirsted on the cross to satisfy our hunger for righteousness. Jesus fills the cup of salvation with the same blood shed on the cross for you that we might never thirst again. Whoever feeds on my flesh and drinks my blood has eternal life, and I will raise him up on the last day. For my flesh is true food, and my blood is true drink. Such ordinary words with such extraordinary meaning. By these words, God’s merciful, magnificent love for us is made known once again in Jesus’ crucifixion. By these words, Jesus fulfills the Scripture that foretold his passion for us. By these words, Jesus bears the frailty of fallen man in his own humanity; he is one with us and for us. By these words, Jesus reminds us that he is Lord of all, even the ordinary, every-day things, like being thirsty. O.P. Kretzmann. Seven Words for Good Friday. The Pilgrim. St. Louis: Concordia Publishing House, 1944, p. 48. Sermon for Lent 4: "Faith Comes by Hearing"
Even in our world of Google, fake news, and YouTube videos, many of us still hold to the old cliché: seeing is believing. Flying cars like the Jetsons…A movie that’s just as good as the book…A low-carb beer that actually tastes like beer…I’ll believe it when I see it. In today’s readings, Jesus calls us, along with the man born blind, the disciples, and the Pharisees, to hear and believe Jesus’ Word. And in hearing, to truly see Jesus as the Light of the world. Today, Jesus opens our eyes to his Word and promises through our ears. Jesus, the light of the world opens our eyes to be fixed on him, to gaze upon the glory and beauty of his death on the cross for us. From the Prophet Isaiah, we hear: And I will lead the blind in a way they do not know, in paths that they have not known I will guide them. I will turn the darkness before them into light. In Paul’s letter to the Ephesians, we hear: For at one time you were darkness, but now you are light in the Lord. And in John’s Gospel, we hear the account of Jesus healing the man born blind. Jesus declares to his disciples and to you: I am the Light of the world. Jesus preaches a sermon in both word and action. 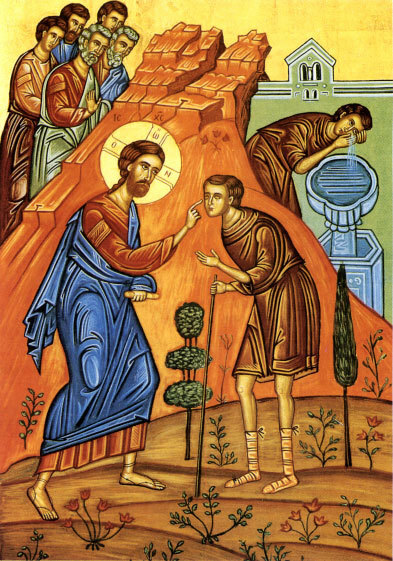 Jesus sees the real, physical problem of the man’s blindness, and heals him. Jesus also sees the real spiritual problem of his disciples, the Pharisees, and us: that apart from Jesus the Light of the world, we are blind in sin. This is why he healed man born blind, and came to heal and save you. That the works of God would be displayed in his death for you. But before we shake our heads at the disciples’ question, it’s fair to say that we’ve all asked this question in some form or another. When we sit in hospital waiting rooms; when we or loved-ones lose their job, get sick, fall victim to tragedy; when we stand by the graveside or sit in the pew at a loved one’s funeral we might ask questions like: Why, Lord? Who sinned that this happened? How could you let this happen? For us, like the disciples, seeing is believing. Or maybe it’s better to say that seeing is often disbelieving. For when we see the world around us broken, hurting, and in utter chaos we doubt God’s Word. The cross is the only way to reconcile suffering and God’s grace in this life. Fix our eyes on Jesus crucified for you. Jesus’ cross is the only way anything on earth is reconciled – indeed by which all things are reconciled. So, it’s no coincidence that John carefully places the physical blindness of this man alongside the spiritual blindness of Jesus’ disciples. The problem isn’t that the disciples ask a theological question in the face of this man’s suffering when they should’ve showed sympathy, care, and compassion. That places a false choice between comfort and compassion and faithfully and truthfully proclaiming God’s Word. The problem is the bad theology in their question. Such is the religion of all the religions of the world, of the Pharisees, and the pious, Pharisee within each of us. We believe in what we see ourselves saying and doing. Do good stuff and God will reward you. Do bad stuff and there’s hell to pay. It’s the religion of cause and effect…and it’s all up to you. And that, Jesus says, is true blindness. And so, Jesus answered, “It was not that this man sinned, or his parents, but that the works of God might be displayed in him. Jesus reveals a great and mystery. God works his good and gracious will in the world even despite the fallen creation we live in. Like a grand chess player, God takes his opponents move and uses it against him. God becomes man to rescue man. Jesus takes this man’s disease, and our sin and death to the cross and dies in our place. Jesus becomes the blind and the sufferer. Jesus becomes the sinner and the condemned. For you. Checkmate. We’re saved, not by what we see, hear, say, and do, but by what the Father sees his Son Jesus, see, hear, say and do for you on the cross. Jesus opened the physical eyes of the man born blind in the Gospel of John. And he opens our eyes and ears to be fixed upon him. Jesus does it through his Word. Think back to the story of the man born blind. He first met Jesus when he was blind. Jesus put mud in his eyes and told him to wash in the pool of Siloam. He did, and when he came back seeing, Jesus was nowhere to be seen. He never laid working eyes on Jesus until later. When Jesus heard that he’d been kicked out of the synagogue, He found the man, and then for the first time, he saw Jesus. Lord, I believe, he said; and he worshiped Jesus. That the doubt and despair we see in ourselves and others finds its answer in the promise and peace in Jesus crucified for us. That the misery and suffering we see in our lives and others around us finds its answer in Jesus, the Man of sorrows who has suffered for us on the cross. That the cold, bitter pangs of death that we see tightening its grip on us daily finds its answer in Jesus who died our death and lives that death may die. All of our questions, doubts, and worries; all our fears, anxieties, and cares; our disease, sin, and death all find their answer in Jesus crucified for you. In order to see Jesus, we must become blind to any notion that we can see God by our own reason, merits, or strength. That’s the paradox of faith. Before we can see, we must recognize that we can’t see. We see by hearing. And through the water and Word of your Baptism, you see the Light of the world who shines upon you. Jesus Christ is the Light of the world, the Light no darkness including your Sin and Death can overcome. One day we will see with new and resurrected eyes, and the sight will be glorious. But now we hear, and in hearing, believe and we truly see. 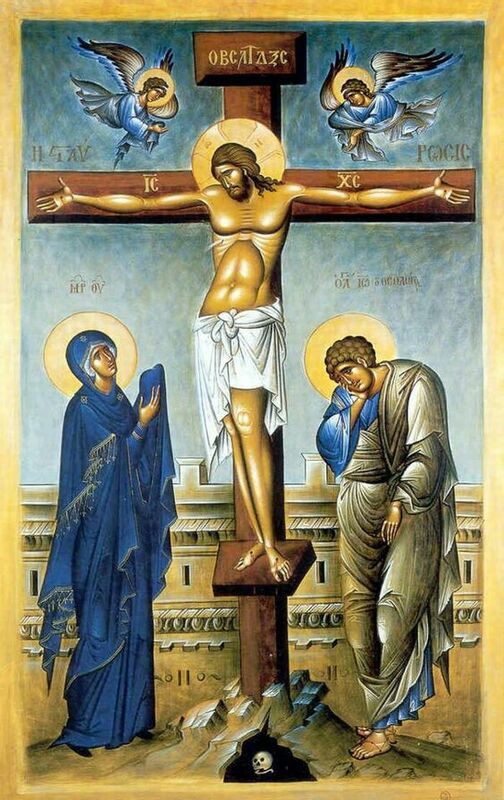 Second Lenten Midweek Sermon: "Jesus' Third Word on the Cross"
Jesus’ third word on the cross allows us to see the cross from Mary’s perspective. From the cross, Jesus comforts John, his beloved disciple, even as he dies to make us all beloved children of God. From the cross, Jesus provides someone to care for his mother, even as he is caring for her and you and me and all by his death on the cross. From the cross, Jesus ensures that Mary, his mother will not be abandoned, even as he is abandoned and left to die alone for the sins of the world. That is, after all, the deadly consequence of our sin: to be left utterly, completely, and forever alone. That is what hell is, not the fire and pitchforks we see in cartoons. No wonder the fear of being alone, of being invisible, and unnoticed is one of our greatest fears. Perhaps you’ve felt this kind of loneliness simply because you’re baptized and bear the cross of Jesus on your forehead and heart. You live, think, and act differently than those around you at work, in your family, at school, or with your friends. We’re like salmon swimming against the raging current around us. Or perhaps our loneliness is more personal. Maybe you’ve noticed the irony that the more we engage in social media to connect with people, the more disconnected we actually become from real, face-to-face human relationships. We live in a world suffering from a famine of real relationships. People are starved for friendship, for human, personal care, for tangible compassion, for someone to understand and care for us. We may not think to call that loneliness, but that’s what it is. But Jesus will not let the devil have the last word. Jesus did not abandon John or Mary. And neither will he abandon you. Maybe you’ve seen the famous statue known as the Pieta, one of Michelangelo’s most well-known sculptures. It depicts the Virgin Mary holding the dead body of Jesus. The word pieta means pity in Italian. This is why Jesus went to the cross for Mary, John, and for you: Jesus is moved by pity, love, and mercy for us in our sin and death. As Mary bore the Savior of the world in her flesh, so now, Jesus bears the sin of the world in his flesh on the cross. As Mary looked after the well-being of infant Jesus, now the crucified Jesus looks after the well-being of his mother from the cross. 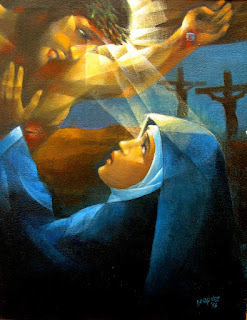 And as Mary once cradled Jesus in her arms and gave him life, so now on the cross, Jesus draws us to the Father’s embrace by his death on the cross, our source of life eternal. Behold, what manner of love the Father has given unto us, that we should be called the children of God. And that is who you are. Mary, John, and all of us, find the answer to our loneliness and sin and death in the words of Jesus from the cross, and in Jesus’ death on the cross for us. 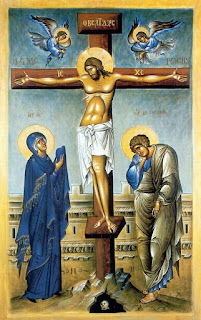 For what Jesus says to Mary and John from the cross is a picture of what he does for each of us by his death on the cross. Just as Jesus provides compassion from the cross for Mary and John, he provides compassion for you by dying on the cross. Just as Jesus comforts Mary and John in their loneliness, he comforts us by promising never to leave nor forsake us. Just as Jesus gives Mary and John a new family, he makes us a part of his family by his death on the cross. For when the fullness of time had come, God sent forth his Son, born of woman, born under the law, to redeem those who were under the law, so that we might receive adoption as sons. Jesus pays for all our sin that separates us from God and from one another. Jesus’ death brings us from the loneliness of sin and death into fellowship with the Father, Son, and Holy Spirit. And there is no greater fellowship than Holy Communion. In the Lord’s Supper you are never alone. Jesus is with you in his body and blood to forgive your sin. And John and Mary, and all the saints are there too…with angels and archangels and all the company of heaven. The Lord’s Supper is a meal of fellowship and reconciliation in Jesus’ death for us. And by Jesus’ cross we are reconciled to one another as well. Though hidden from her sight, in the time after Jesus’ death, resurrection, and ascension, Jesus took care of his mother through his beloved disciple, John. In the same way, he cares for us too. Though we don’t see Jesus, he is with us, hidden in our daily vocations, callings: our spouse and children, family and friends, neighbors, and the like. When you feed the homeless, teach your children, or go to work each day, Jesus is hidden in your vocation as behind a mask, serving others through you. And when you go to the doctor, buy groceries, or are getting your oil changed, Jesus is hidden in the vocation of others as behind a mask, serving you through others. And know if you ever feel alone in this life, or don’t have a family of your own, or your family seems broken beyond repair, fear not. Jesus’ death on the cross gives you a fellowship, a communion, a family unlike any other. Look around you in the pews. Behold, your brothers and sisters in Christ. Care for one another in body and soul. Be reconciled with those you are quarreling with. Forgive those who have hurt you. Love one another as God in Christ has loved you. Bear one another’s burdens. Grieve when someone grieves and rejoice when someone rejoices. And above all, fix your eyes on Jesus. Behold, your brother and your Savior, crucified for you. Behold, our redeemer and friend. For greater love has no one than this, that one lay down his life for his friends. First Lenten Midweek Sermon: "Jesus' Second Word on the Cross"
We don’t know the whole story of the thief on the cross. what he stole; how he ended up on the wrong side of Roman law – after all, the Romans didn’t mess around with larceny; theft was a one-strike crime and a one-way trip to the cross; we don’t know what his life was like before he spoke those famous words of repentance and faith: Jesus, remember me when you come into your kingdom. 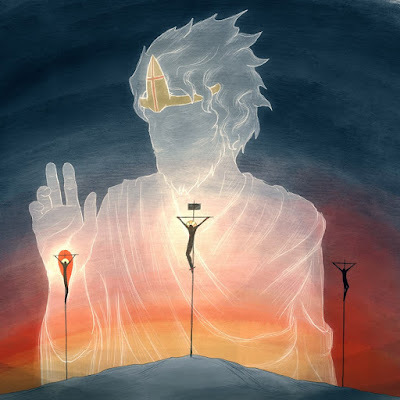 We may not be able to write an entire episode of CSI: Jerusalem starring the thief on the cross, but we do know the most important part of his story. We meet this thief on the cross near the end of his life, or so he thought. In reality, it was the beginning of an unexpected story, with an unexpected ending. The thief dies, yet lives. The criminal is guilty, yet declared innocent. The man is on the cross dying next to Jesus and yet with Jesus in paradise. The other thief, the one who mocked Jesus, was right about one thing at least. Jesus could’ve saved himself horrific pain and a world of agony and bitter death by coming down from the cross. But he could not have saved that thief or you or me if he had. So, Jesus stayed on the cross for you and the thief. And the penitent thief saw in this naked, bleeding, dying man his King and ours. We’re not so different from that thief on the cross. Today, each of us comes with different circumstances. Some content and filled to the brim with life, happiness, and countless blessings. Some empty, hurting, bearing scars from the battlefields of life, empty souls, struggling faith, and wounded hearts. Others ache with the loss of someone we love, or for love that we desire but never quite seem to find. And still others wonder whether anyone thinks they’re valued and loved. Whatever kind of day today is for you, whether you’re hurting or happy, empty or full, content or anxious, we all need that prayer of the thief on the cross. It’s a prayer of deliverance, from sin to grace, from a fallen world to a new creation, from death to life. Today, that prayer is ours as well. We too need deliverance. Do we not fear God, since we are under the same sentence of condemnation? For the wages of sin is death. But these words are not only for the ears of the thief on the cross. Jesus speaks these words to you today. The kingdom, paradise, and forgiveness that Jesus promises is found in Jesus crucified for you. The ancient church said it this way: The cross of Christ is the key to paradise. Now in Lent, we see the fulfillment of these words in Jesus crucified for us. As Adam was overcome by the serpent and the tree of the garden, Jesus, the second Adam overcomes Satan by the tree of the cross. And as Adam and Eve were barred from returning into paradise by the Cherubim’s flaming sword, Christ opens the way to paradise by his death on the cross. The cross of Christ is the key to paradise. This was true for the thief on the cross. And it is true for you as well. Jesus, the innocent one, takes on all our guilt, shame, sin, and death in our place, and in exchange gives us his righteousness, holiness, life, and salvation. Like the thief, we deserve death, yet live. We are guilty, yet declared innocent. We were exiled, fallen, broken sons of Adam and daughters of Eve, but through the cross, Jesus has brought us back into paradise. Jesus’ second word on the cross is a reminder that wherever Jesus’ Word is heard, Jesus is there for you. And wherever Jesus is, there is his Kingdom, Paradise, and all his promises to you. Where water is poured out in the Name of the Father and of the Son and of the Holy Spirit, Jesus is there for you. Where Jesus’ Word joins heaven and earth in the bread and the wine, Jesus is there in his body and blood for you. As he spoke to Zacchaeus, Jesus says to you: Today salvation has come to this house…for the Son of Man came to seek and to save the lost. As St. Paul proclaims: behold, now is the favorable time; now is the day of salvation. 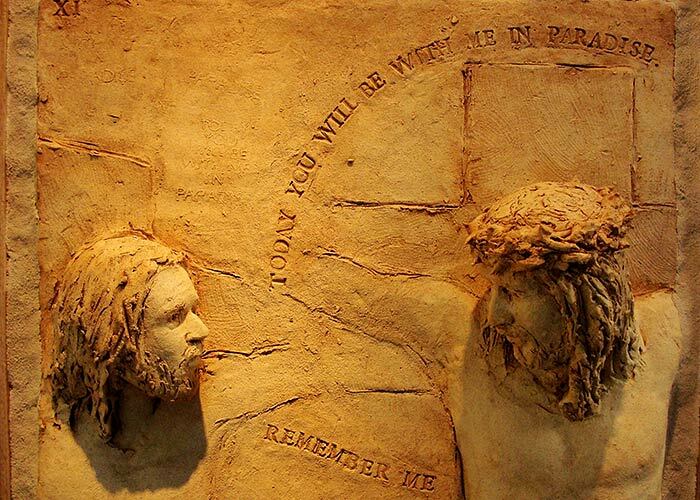 As Jesus declared to the thief on the cross, so he says to you: Today, you will be with me in Paradise. Today is your day. Today is the day of God’s favor and salvation for you, whoever you are, and whatever your story is, today Jesus writes a new ending for each of us, penned with his blood shed on the cross for you. No matter what your sin, no matter how anxious your mind or how heavy your heart, no matter how deep your wounds, you are not alone. Jesus’ promise is for you. Today and always. Today you will be with me. Ash Wednesday Sermon: "Jesus' First Word from the Cross: Forgiveness"
Martin Luther once said the church is the mouth-house of God. Here, God calls us to receive his word, listen to Jesus’ word, and speak that word to others around us. This is especially true in the season of Lent. As good as the soup suppers will be, Scripture reminds us that man does not live by bread alone but by every word that comes from the mouth of the Lord. If we are to speak, sing, and confess Jesus’ word, we must first be filled. That’s why we have additional weekly services during Lent: to hear Jesus’ word of forgiveness. That’s what the ancient practice of fasting or “giving something up for Lent” is about: forgoing something for more time to hear God’s word, or fasting from something to use that money for the support of spreading God’s Word. This is arguably one of the harder of Jesus’ words on the cross: Forgiveness. I’ve talked to many dear saints who’ve confessed that the hardest part of the Lord’s Prayer to pray is, “Forgive us our trespasses as we forgive those who trespass against us.” I imagine that’s true for all of us some days. We think of historical stories, like, Corrie Ten Boom, a Christian woman who was thrown in a Nazi concentration camp for hiding Jews in WWII, and later after the war was over, came face to face with one of her captors following her presentation on forgiveness. What did she say? What would we say? Or perhaps fairy tales like Cinderella come to mind. The most recent Disney version of Cinderella illustrates this well. The wicked step-mother is portrayed in all her vile, cruelty. And her snotty daughters revel in physically and emotionally abusing Cinderella. Together they mercilessly humiliate, degrade, and dehumanize her every chance they get. How did Cinderella respond? How would we respond? We want to place limits, conditions, terms, stipulations, and quotas on our forgiveness, treating it like the height requirements at a Disneyland ride. We’re quick to anger and slow to forgive. We forget all manner of sins we commit against others but when it comes to those who have sinned against us, we have an instant replay, photographic memory. Thankfully, God’s ways of forgiveness are not our ways. When you consider where Jesus was and what he endured, these are remarkable words. Jesus was rejected by his people. His own followers deserted him. One of his closest disciples betrayed him. His best friend denied having anything to do with him. 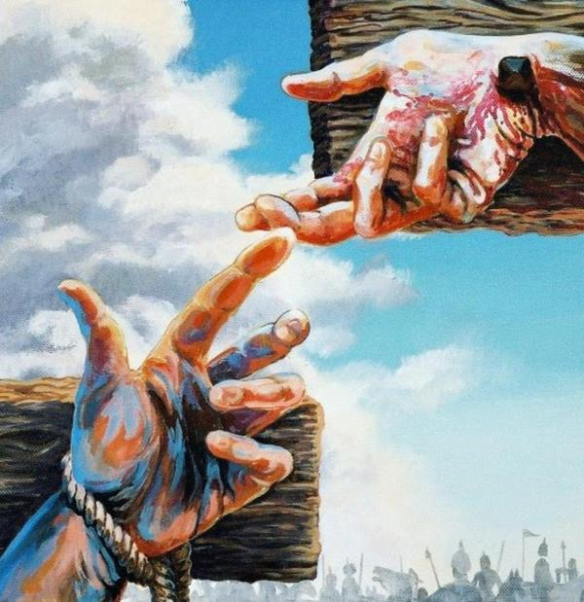 He was tried in a kangaroo court by the religious authorities, taken to the Roman governor who declared him innocent, yet still delivered him over to be scourged and executed. Jesus was pummeled with verbal abuse. False prophet. Blasphemer. The Roman soldiers mocked him with royal robes, a crown of thorns upon his head, and a reed in his hands for a scepter. Then they bowed before him and pretended pay him homage, only to laugh and strike him with the reed. The priests and people reviled him. Jesus was beaten, scourged, fastened to the cross with iron stakes, and left to hang naked, bloodied, and on display for all the world to see. Yet, in the midst of all this, the first words from Jesus’s mouth as he hung from that cross was a prayer. 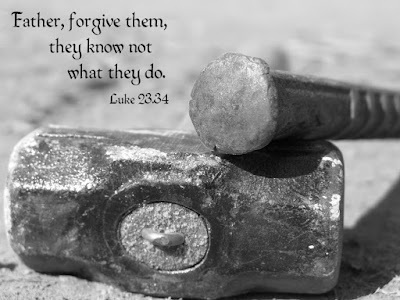 “Father, forgive them, for they know not what they do” (Luke 23:34). Jesus prayed for his persecutors. Jesus prayed for Peter who denied him, for Pilate who unjustly sentenced him to death, for the religious authorities who mocked him, and the soldiers who executed him. While they were killing him, the doctor was curing the sick with his blood (Augustine). But Jesus also prayed for you. He prayed to forgive us our trespasses as we trespass against him. He prayed to forgive our mockery, our lies, our anger, our selfishness, our judgment, our grudges, and to forgive all our sin. 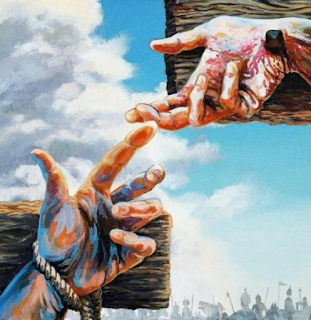 As Jesus hung on the cross he prayed for our forgiveness while at the same time he was dying to win our forgiveness. This is why he came…to forgive, save, and redeem you. God made us alive together with him, having forgiven us all our trespasses, by canceling the record of debt that stood against us with its legal demands. This he set aside, nailing it to the cross” (Colossians 2:13‒14). This is why Redeemer Lutheran is here in Huntington Beach: to receive forgiveness in Jesus’ name, and to speak forgiveness to others. This is why we have a preschool, Bible studies, and music programs. It’s why we celebrate and encourage one another to receive the sacraments of absolution – in public and private, the daily gift of Baptism, the Lord’s Supper more and more. Because more hearing and more receiving of Jesus’ Word and body and blood means receiving more forgiveness. Every sinful thought is forgiven. Every wicked word is forgiven. Jesus hangs on the cross for you! Jesus pleads for your forgiveness! When Corrie Ten Boom came face-to-face with one of her former Nazi tormentors, by God’s grace, that’s what she did. She took his hand and forgave him. When we look at the sins others have committed against us and we have committed against them, this is also how we live, forgiving one another as God in Christ has forgiven us. C.S. Lewis, Mere Christianity, Book 3, chapter 7. San Francisco: Harper Collins, 2001. p. 115.